If you love makeup then you know how painful it is when at the end of the day you have to wash and clean your makeup brushes. You may not need to wash them every day depending on how you use them but after excessive use, it is necessary, not just for the sake of the brushes but also for you. 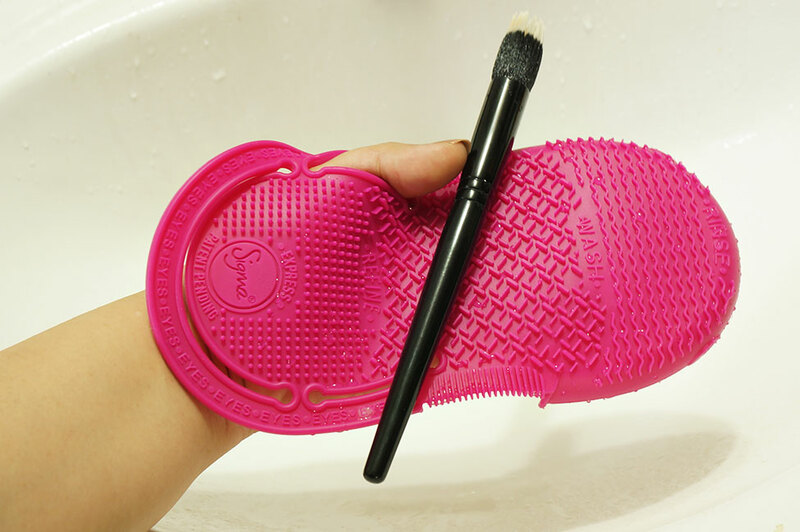 Sigma Spa Express Brush Cleaning Glove makes it easier and more fun to wash your brushes the right way. Many women complain how their face is breaking out or getting a rash no matter which makeup they are using. 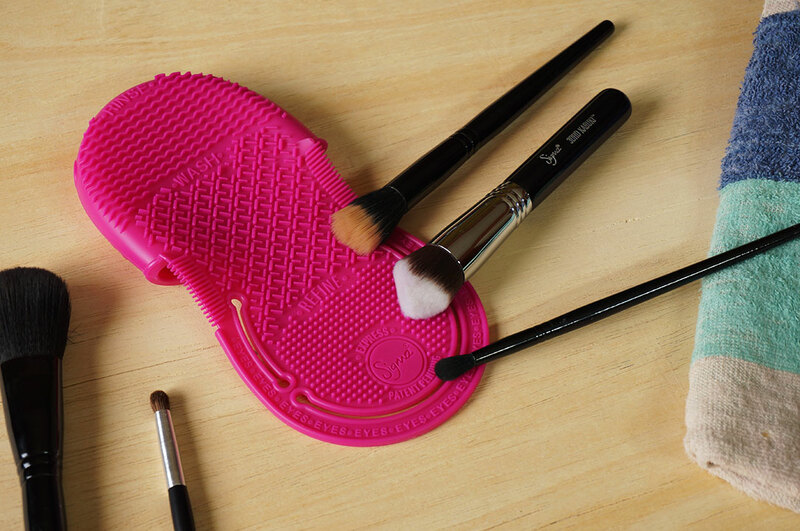 They forget that they should keep their brushes clean which get dirty and collect bacteria leading to all the skin issues they face. So it's settled, makeup brushes need to be cleaned now and then. lots of festivities so that means more brush cleaning which I never looked forward to. I used to clean my brushes on my palm which was ok if you are washing one or two but tend to get annoying after a while. When I got SIGMA Spa Express Brush Cleaning Glove I actually started enjoying my brush cleaning ritual. The PATENTED Sigma Spa® Express Brush Cleaning Glove was designed as a compact brush cleaning device featuring 7 patented textures for both eyes and face brushes. The glove provides a quick and effective cleaning process including a universally fit strap to be placed around the thumb and wrist to help secure the glove during vigorous brush cleaning. The overall packaging and design is impressive; the product itself is unique. When you first look at it, you will be in a state of wonder. 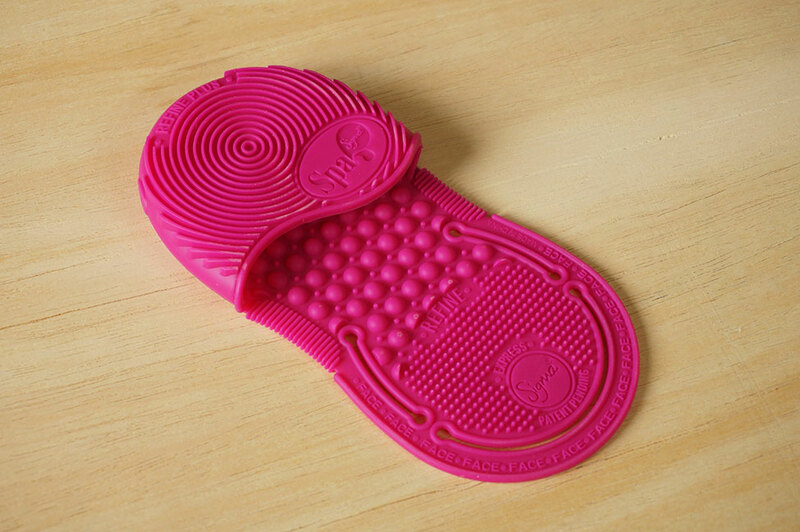 The good qualities about the product itself is that it's made of non-toxic material and is latex as well as lead-free. It has 7 patented textures which include wash, rinse, refine and refine plus for each side. The two sides, each dedicated to Face and Eyes, clearly stating it as well, are easy to wear and use. Interesting thing about this Glove is that you can flip it over to the other side, you can pick and chose the grooved sections as per your brush washing needs (eyes or face). It's made of silicon so its really flexible. Let me explain a little bit more in detail. The Spa glove is designed into sections of different groves created according to the brush you are washing (The side with bigger texture is for face brushes and the side with smaller texture is for eye brushes) as well as the process from washing to rinsing and refining your brush. It is extremely user-friendly because every section has guiding words like Rinse, Wash and Refine which makes it easy for everyone. Sometimes for smaller or lighter face brushes I use the eye side as well (as you can see in my photos). Its up to you to test out what works for you but the glove helps nonetheless. 1. Easily fit the Glove on your hand. Make sure you fit the side you want: Eye brush cleaning or face brush cleaning. 2. Wet your brush under tap water. Always a good idea to do this brush cleaning ritual in your bathroom sink. 3. 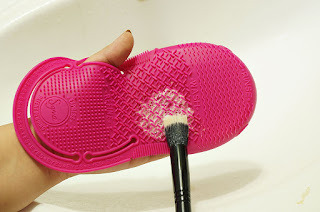 After wetting your brush add a small amount of brush cleaning solution. I prefer Dettol Anti-bacterial Hand wash or Johnsons and Johnsons baby Shampoo. Both work fine for me. You can actually get Sigma brush cleaning solution as well. 4. After adding a little water to the brush start deep cleansing on the Sigma glove 'Wash' section in swirling motion. 5. 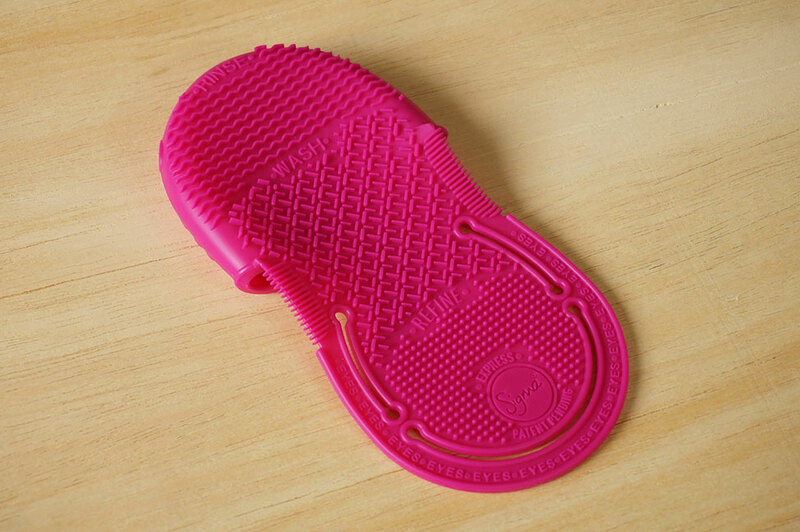 For rinsing place glove and brush under running water, sweep back and forth on the 'Rinse' section. This will remove makeup residue as well as soap. 6. After that swirl brush on the 'Refine' section for further deep cleansing. 7. 'Rinse' your brush and then finish off by gently squeezing your brush to remove excess water. 8. After washing I usually place all my brushes flat on a clean towel so they can dry off. 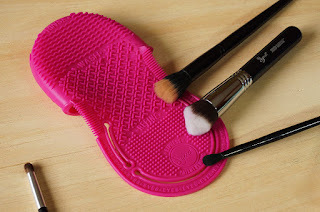 TIP: Always wash your brushes upside down aswon'twont loosen up the glue inside which can lead to shedding. The spa glove is a life savor of brushes. It is gentle yet thorough with its cleaning process. After you are done you can easily tuck it up and can even take it during travelling due to the compact size.